This one is not for the faint hearted folks: a testing and adventurous drive through some of Australia's most rugged terrain. 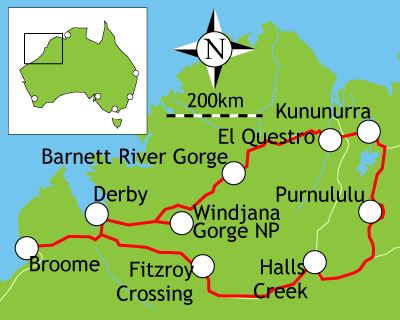 Your route does a full circle, first taking the dusty Gibb River Road to Kununurra, then returing to Broome via the Great Northern Highway. So pack the camping gear into your hired 4WD and prepare to be blown away by the mystical beauty of the Kimberleys, where deep red sand and rock formations and lush green vegetation provide a home to the widest diversity of Australian wildlife in Western Australia. Please note that due to the rough nature of some of the roads you will be navigating this drive is not to be attempted with anything other than a 4WD vehicle. From Broome you head north to Derby, where a night is spent in preparation for tackling the Gibb River Road, which is the 4WD option of crossing the Kimberleys. Once used to drove cattle to Derby for export, this dirt road takes you right throught the heart of cattle country and past some of the most amazing gorges and rock formations you are likely to see. The first half of your 10 day trek takes full advantage of these gorges, with your second night on the road spent camping at Windjana Gorge National Park, and your third camping at the Barnett River Gorge. You then head on to El Questro Wilderness Park, which is also a fully operational cattle station. The wide expanses of this park offer much in the way of exploring, and there are numerous activities on offer. Kununurra is your next stop, and this modern town is your chance to re-acquaint yourself with civilisation. Enjoy a peaceful night amongst the friendly locals, and stock up on camping supplies for the rest of the journey. The next two nights are spent in Purnululu National Park, home of the bizarre Bungle Bungle range of beehive shaped mountains. Two nights are required here to give you the chance to fully appreciate how special this area is. After Purnululu you get back onto the Great Northern Highway and continue south to the Gold Rush town of Halls Creek, which has the site of the first gold mine in WA located nearby. Your last night on the road is spent in Fitzroy Crossing, before you head back to Broome. This is an easy drive of 220 km to ease you into your road trip. Going straight up the Great Northern Highway, this will take you about three hours. Derby is a sprawling and decentralised town, as is typical of many towns in this part of Australia. Characterised by its population of large Boab trees, this was the pioneer town of the Kimberleys, and you will find adventures of your own in the surrounding regions. Just South of Derby is the famous Boab Prison Tree. Over 14 metres in diameter, this hollow tree used to be used as an over night lock up facility by early police patrols. Its impressive size and its historical significance make it an interesting trip out of town. Keen anglers can try their hand at fishing on the Fitzroy River, which is richly populated with over 40 species of fish. This is where the real adventure begins, as you roll onto the Gibb River Road for the first time. The 125 km drive to the Windjana Gorge will take you about 2 hours. The gorge consists of two 3.5 km long red walls rising up either side of the alluvial floodplain of the Lennard River, which winds its way throught the whole of the Napier Range. The river only flows during the wet season, but deep pools remain up its length that provide a home to freshwater crocodiles and a base where numerous birdlife and the resident fruitbats can thrive. The gorge walk is a 7 km round trip that takes you up and down both sides of the gorge, giving you perfect views of the scenery and the wildlife. Ideal for photographers, this isolated and natural area is a superb introduction to your surroundings of the next few days. The only means of accommodation is the camping ground at the gorge. You pay your park fees and your camping fees at the ranger station upon entry into the park. There are shower, toilet and telephone facilities at the campsite. Make yourself at home but be sure to clean up after yourself for the next lot coming in. Double back on your tracks from Windjana until you reach The Gibb River Road again, and turn east onto it. This drive is only a couple of hours long, so take it slow and enjoy the Kimberley scenery and the exciting four wheel driving! Just 1 km off the Gibb is Galvans Gorge, a horse shoe shaped gorge that exemplifies the lush tropical vegetation of the Kimberley. There is a small campsite there, and a safe swimming hole you can cool off in. Feeling refreshed, carry on down the Gibb Road until you reach the Mt Barnett Roadhouse, which provides fuel and some limited supplies. Aboriginal artwork painted by members of the local Indigenous population is on sale here, and is indicative of the rich aboriginal heritage of the area. Close to the roadhouse is Manning Gorge, which has a large and popular campsite run by the roadhouse people. This is the first option you can choose for bedding down for the night. Walks up Manning Gorge are available, and there is a lot of Aboriginal rock paintings to be seen on the way. The gorge is divided into two parts, the lower and the upper. The lower consists of white sandy beaches set in idyllic and lush surrounds, and the upper is about 2 km away and has frothy waterfalls flowing into deep rock pools. The camping site here can sometimes be quite full, in which case we suggest you move on to Barnett River Gorge. The turn off to this gorge is 28 km past the roadhouse, and although camping is free there are no facilities. The pristine beauty of this spot seems to make up for this inconvenience: set amongst the rugged red sandstone formations is a grove of shady paperbark trees, and a series of pools and waterfalls traces their way through the gorge itself. Over here the only disturbance to the peace is the constant chirping of the diverse birdlife calling from the trees close to the water. An early start is needed for this long drive, which is close to 300 km and will take you nearly 6 hours of continuing east along the Gibb Road. However, you are justly rewarded by the El Questro Wilderness Park where full camping facilities are available, as well as more comprehensive, and expensive, accomodation. A fully working cattle station with over 5000 head of cattle, El Questro is over a million acres in size. Boasting four seperate river systems there is a diversity of terrain and features throughout the park that boggles the mind, and provides an abundance of opportunities for exploration. Visit the Zebedee Springs, a natural spa and oasis where mineral rich thermal waters rise up amongst lush and tropical palms. Steep red cliffs surround the springs, adding a sense of drama to the beauty. Relax and watch the thousands of butterflies floating between the palms. Chamberlain Gorge is a 3 km long fresh waterhole situated beneath a towering escarpment and is bordered by diverse flora and fauna. Full of hungry barramundi, this spot is an anglers dream. Other gorges you can visit are the Amalia Gorge, which is a steep sided valley with amazing views, and a clear blue plunge pool, and the El Questro Gorge. This gorge has a dense rainforest canopy that keeps it cool during the day and encourages a populous and diverse ecosystem which thrives under the conditions. Retrace your tracks to the Gibb River Road and turn right. This short drive is 150 km long and takes about 2 hours if you don't stop, so it gives you ample time to explore El Questro a bit further if that's what you want. Kununurra is like a modern oasis situated in a mysterious world of red rocks, waterfalls and thick vegetation. The locals are friendly and welcoming, making this the perfect base to explore the surrounding attractions. It is also a good opportunity for you to reacquaint yourself with civilisation and to stock up on supplies for the rest of your trip, which takes you back to Broome via the Great Northern Highway. Lake Argyle is an artifical lake created on the Ord River to provide water for an irrigation scheme that has allowed large quantities of fruit, vegetables and crops to be grown in the region. It has also attracted thousands of species of birds and wildlife that roam the tall red cliffs rising out of the expansive body of water. The barramundi fishing is second to none here, or if it's tranquility you crave then why not go for an evening cruise and toast the sunset? On the road to Wyndham the river has flooded over the road, and the waters pouring past have created perfect fishing conditions for barramundi. Locals frequent the crossing and if you are passionate about fishing then this is the spot for you. Just a few kilometres west of Kununurra you can take in another gorge. A series of waterfalls run into this canyon which has a safe and natural swimming hole at the bottom. Swim under the spray of the falls for a fresh and natural shower! Your Purnululu experience takes up two days of your trip because any less would not do justice to the wide beauty and far reaching attractions of the park. The roads are not easy either, so it is best to take them slow and not rush around the park. The distance to the park is 326 km, travelling south on the Great Northern Highway via Warmun. Remember that Turkey Creek is the last service station before the entrance to Purnululu National Park. The Spring Creek Track turnoff, which leads into the park is 52 km south of Warmun. The track after this turn off is very challenging, and will take up to 3 hours to navigate. The drive down passes through some of the country's largest cattle stations, so enjoy the vastness of this cattle country before you reach the rockier and more rugged terrain of the National Park. The first day in Purnululu consists of your drive in to the park, and getting your camp established. On the way into the park you pass a ranger station, which is where you pay your park fees and your camping fees (about $9 per person.) There is a choice of two camping sites, Kurrajong or Walardi, and you nominate which one you are staying at upon entry to the park. Kurrajong comes recommended, because it is just a 16 km drive from the Echidna Chasm, which is one of the best walking sites in Australia, let alone the park. On your second day in the park you make your way to the face of the Bungle Bungle Range, which is a fascinating geological formation consisting of peculiar rocky striped mounds rising 300 m or so out of the ground . The shape of these mounds makes them appear like a series of beehives, and this is compunded by their regular banding of orange and black stripes. A skin of silica and algae gives them a glossy sheen that creates colour transitions following the rains. In and around these 'beehives' is a hidden world of gorges, pools, caves and Aboriginal art, which awaits your exploration. Be sure not to miss Picaninny Creek, which is on the southern edge of Bungle Bungle. Its dramatic high walls are adorned with green ferns. After a day exploring the park, return to your campsite to rejuvenate and prepare for the drive to Halls Creek tomorrow. This drive of about 160 km will take you a fair bit because of the 53km stretch through the park back to the Great Northern Highway, which takes about 3 hours. The next 100 km down the highway to Halls Creek is smooth sailing. An early gold rush town, gold fever is still in the air here, with many prospectors living in the area. Russian Jack, a goldmining character form the turn of the century is immortalised in the town square in the form of a statue. You can visit the site of the first goldrush in WA after the discovery of gold in 1885. South of Halls Creek is Wolfe Crater, the second largest meteorite crater in the world, made famous by the Australian movie, "Wolf Creek". To get there is a daytrip in itself however, as it is over 151 km away. A few kilometres out of town is the China Wall, a strange limestone formation that rises out of a creek over a small hill. It looks uncannily like a small version of the Great Wall of China. This park offers you the choice of powered caravan sites, camping areas, single rooms and cabins, and is ideal for those only spending a night or two. The parks facilities include two Shower and Toilet Blocks, two laundries, clean ablutions, a swimming pool, BBQ area and a small supermarket. This lodge has caravan and camping sites and a limited number of rooms. There is no electricity, as the lodge runs on generator so power is limited. This is a good place for those eager to do a bit of gold panning themselves, as you can hire metal detectors from the owners, and pick their brains for some local knowledge. There are kitchen and bathroom facilities as well. This is a relatively easy drive straight down the Great Northern Highway. The 290 km will take you about 3 hours and 20 minutes. The principal attraction of this town is the Geikie Gorge, which is about 15 km north of the town. Here the Fitzroy River has cut deep into the limestone ground, carving steep high cliffs each side of the gorge. Tunnel Creek is about 63 km north of the town. Here the waters from the creek have cut a 750 metre high tunnel through the ancient limestone barrier reef system. The echoey cavern has amazing stalagtites and rock formations, but you will need a torch to see them! The Tunnel Creek National Park is accessible by non-4WD vehicles, so any travellers making the trip from Broome to Kununurra on the highway can give it a visit. This is the last leg of the journey, and the 395 km down the highway will take you about 4 hours and 50 minutes. It's recommended you leave early, so you can make the most of the sights and sounds of Broome before dusk falls on the last night of your trip. 22 km of pristine white sand bordering the deep azure of the Indian Ocean has seen this beach voted as one of the five best beaches in the world! The unique thing about this beach is that unlike the rest in this part of Australia, it is safe for swimming. There is no threat from sharks or crocodiles!! Do remember to watch out for stingers between November and April however. Camel rides up the beach are particularly popular. There are other amazing beaches, including Town Beach and Riddell Beach. At low tide at town beach you can see the wrecks of 3 flying boats shot down by the japanese during World War II. Riddell Beach is about 8 km out of town, and is the perfect place to escape from it all. It is surrounded by the red cliffs that you will have become very familiar with after your journey through gorge country, and these contrast beautifully with the blue of the ocean. Located 30 km out of Broome, this is more of a destination for travellers needing a place to hold up for the night. It does have great dining and accommodation facilities, but being on the highway there is not much in the way of scenery. Return your rental and start working on that scrapbook!